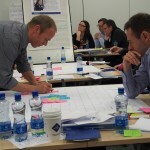 Hosted at the Customer Innovation Centre at Medtronic in Galway, the second day of our Design Thinking Masterclass series was bustling with activity. Project boards displaying a huge variety of projects adorned the room and formed the basis for the next stage of our learning. It was a very colourful session, with post-it’s and stickers a key feature of our creativity session! The opportunity to see Design Thinking in practice in Medtronic was superb. The Innovation Walk which we participated in during the afternoon demonstrated in practice exactly what we have been learning since we begun this masterclass. And to hear the benefits of direct engagement at the centre with Medtronic’s customers and how they can improve their innovation by working closely with physicians and customers was really insightful. Our thanks to the team at Medtronic for all their support in making this such a unique experience.